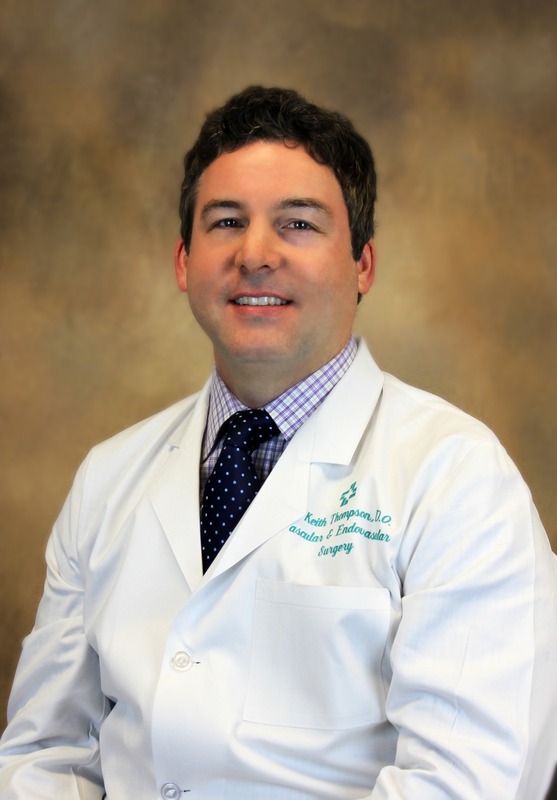 Dr. Keith Thompson is a vascular surgeon at Hattiesburg Clinic Vascular Specialists. He received his medical education at Kansas City University of Medicine and Biosciences in Kansas City, Mo. He also completed an internship at the University of North Texas in Ft. Worth, Texas, and a vascular and endovascular surgery fellowship at the University of Cincinnati in Cincinnati, Ohio. Dr. Thompson served his residency at Doctor’s Hospital at Ohio University in Columbus, Ohio. He is board certified by the American Board of Surgery. He is professionally affiliated with the Society for Vascular Surgery, Peripheral Vascular Surgery Society, American College of Surgeons, American College of Osteopathic Surgeons, American Medical Association, Society for Clinical Vascular Surgery, and Mississippi State Medical Association. Hattiesburg Clinic Vascular Specialists IS Hattiesburg’s only fellowship-trained vascular and endovascular surgeons. We appreciate the trust and confidence you have placed in us. Vascular specialists have a unique opportunity to have a life-long relationship with our patients. The services we offer provide treatment for two types of venous diseases, spider veins and varicose veins. Spider and varicose veins are abnormal, dilated blood vessels caused by a weakening in the blood vessel wall. Spider veins are red, purple or blue clusters of small veins that are usually just a cosmetic concern. Larger than spider veins, varicose veins are a blue color and have a tendency to bulge. Risk factors for venous diseases include obesity, pregnancy and prolonged standing. Kansas City University of Medicine and Biosciences - Kansas City, Mo.